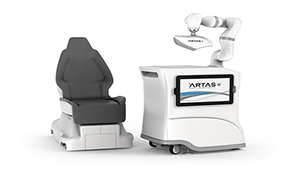 Restoration Robotics, Inc, the global leader in robotic hair restoration, today announced the launch of its new ARTAS® iX Robotic Hair Restoration System. The ARTAS iX Robotic Hair Restoration System is the only robotic intelligent solution to offer precise, minimally invasive, repeatable harvesting and implantation functionality in one platform. The ARTAS iX System is equipped with a 3-camera stereoscopic vision system with 44-micron resolution and a 7-axis robot. The system delivers unmatched procedural analysis, precision, repeatability, and clinical workflow efficiency for hair restoration. ARTAS iX features a compact, motorized, battery-powered, portable and adjustable procedure chair for increased patient comfort and clinical versatility that can be used ergonomically in multiple aesthetic procedures. Ryan Rhodes, CEO of Restoration Robotics, said, “We believe the introduction of the ARTAS iX system is a major transformative milestone for Restoration Robotics and the hair restoration industry. Robert M. Bernstein, MD, Clinical Professor of Dermatology at the College of Physicians and Surgeons of Columbia University and founder of Bernstein Medical Center for Hair Restoration, a state-of-the-art hair transplant facility in New York, NY commented, “The new ARTAS iX system marks a pivotal development in hair restoration technology. It will enable physicians to deliver outstanding results for their patients while reducing the more labor-intensive aspects of hair restoration procedures. Restoration Robotics, Inc., is a medical device company developing and commercializing the ARTAS™ Robotic Hair Restoration System. The ARTAS System is the first and only physician-assisted system to dissect and assist in the harvesting of follicular units directly from the scalp, create recipient implant sites using proprietary algorithms and now implant the hair follicles into the designated sites. The Company has unique expertise in machine vision, image guidance, visual servoing and robotics, as well as developing intuitive interfaces to manage these technologies.